REGISTRATION EXTENDED TO MAY 6th! Due to the great success of registration so far and multiple demands to extend the registration process, we have decided to extend it to May 6th at the very latest. 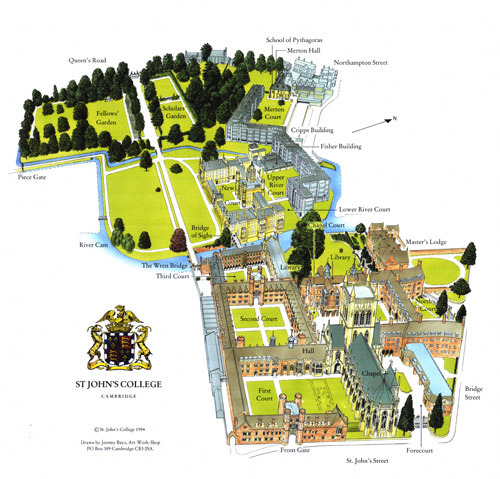 Please also find a map of St John’s College below, with directions to the School of Pythagoras, where the conference will take place. for more information, do not hesitate to contact us. Registration is open until April 30th. Registrations are still open , do not hesitate to contact us for more details! 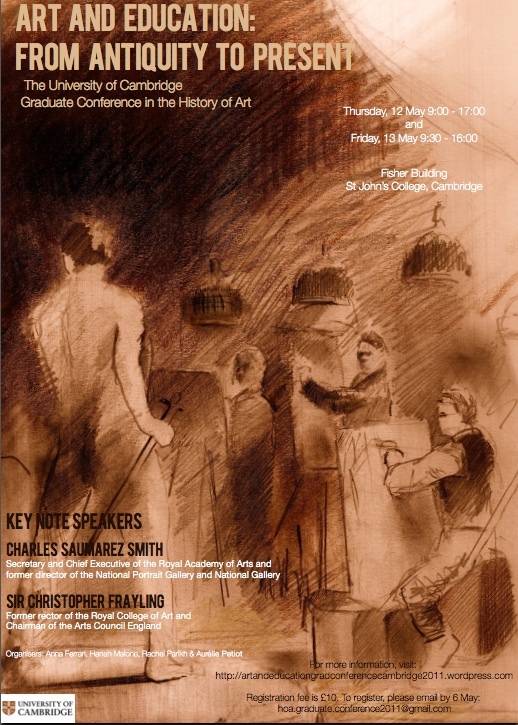 The University of Cambridge Graduate Student Conference in History of Art will be held on the 12th and 13th of May 2011. The conference will cover the relationships between art and education over a wide geographical and chronological spectrum. Keynote Speakers: Charles Saumarez Smith, Secretary and Chief Executive of the Royal Academy of Arts and former director of the National Portrait Gallery and National Gallery. Sir Christopher Frayling, Former rector in charge of the Royal College of Art and chairman of the Arts Council England. Elaine Williams (University of Birmingham), ‘Birmingham school of art’ Registration for the conference opens on the 12th of April. To register, please email hoa.graduate.conference2011@gmail.com with ‘Registration’ as the subject, as well as sending a cheque for £10, made payable to ‘University of Cambridge’, to Hannah Malone, St John’s College, Cambridge, CB2 1TP, UK. Enquiries regarding other forms of payment should be addressed to hoa.graduate.conference2011@gmail. The University of Cambridge Graduate Student Conference in History of Art will be held on the 12th and 13th of May 2011. Royal Academy of Arts and former director of the National Portrait Gallery and National Gallery. Sir Christopher Frayling, Former rector in charge of the Royal College of Art and chairman of the Arts Council England.